Japan’s Takahito Mura performs his Short Program at 2014 Skate Canada. Although Japan’s Takahito Mura has been competing at the international senior level since 2008, it wasn’t until last season that he had a major breakthrough after winning his first Grand Prix event, Trophée Éric Bompard, as well as the 2014 ISU Four Continents Championships. This season, the 23-year-old from Okayama City, Japan, continued his ascent when he won the title at Skate Canada and followed up with a bronze at NHK Trophy, qualifying for his first Grand Prix Final. In the Final, Mura missed his quad in the short program and was ranked sixth, however, he did better in the free and landed two quad toes and six triples to move up to fifth place overall. In hindsight, the two-time Japanese bronze medalist felt that he was maybe over-motivated and wanted too much to do well. 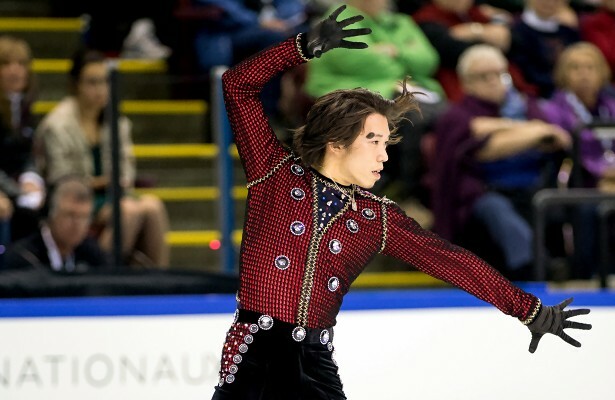 Mura’s consistency has improved overall since last year, and although he missed the cut for the Olympic team after finishing sixth at nationals, he capped off the season when he won his first ISU Championship title at Four Continents. Looking back, Mura admitted that his jumps needed work. Mura will be 28 when the next Olympics roll around, and he is well aware that continuing to jump will be a challenge. He took the advice of Mie Hamada, a Japanese coach he worked with (in addition to his father and long-time coach, Takashi Mura), and worked with 1998 Olympic champion Ilia Kulik. Once the jumps became more consistent in practice, they became more consistent in competition. “I also did a lot of basic training including dancing and ballet, and I think it really helps with my overall presentation and performance,” said the skater. Mura’s improvement became obvious at Skate Canada when he put out an excellent performance of his “Phantom of the Opera” free program and outskated Spain’s Javier Fernandez. “There was absolutely no pressure at Skate Canada and it went really well,” Mura recalled. Interestingly enough, music to The Phantom of the Opera soundtrack is very popular for Japanese skaters this season, as Hanyu and Kanako Murakami are using it in their free skate as well. However, he claims that due to the lyrics, and depending on the sections used, it can feel very different. “I wasn’t really too concerned,” Mura said. Mura, who was married in 2013 and became a father, pointed out that he chose this music as it encompassed how he felt about his family. In the short program, Mura chose another “skating warhorse” with Carmen. At NHK Trophy, Mura led after the short program, but then slipped to third after several errors. Prior to NHK Trophy, the 2014 Skate Canada champion missed some practice time as he had to change his boots and suffered a slight injury. The 2014 Lombardia Trophy silver medalist is now preparing for nationals which will take place this week in Nagano, Japan. With the field being so deep for the Japanese men, earning a spot for Four Continents and Worlds will not be easy. He is up against Olympic Champion Yuzuru Hanyu, who came back strong at the Grand Prix Final, World silver medalist Tatsuki Machida, NHK Trophy Champion Daisuke Murakami, and Junior Grand Prix Final Champion Shoma Uno. As a result, Mura is pushing himself and has been working on the quad Salchow, which he hopes to have ready by next season. The 2014 NHK Trophy bronze medalist has actually has been to Worlds twice before, placing 15th in 2008 and eighth in 2013. Mura admits that having a family has changed his approach to skating. The former junior national champion is not certain if he wants his little daughter, Kanna, to follow in the family tradition and become a skater like her father and grandfather.